Flour from the Old Stone Mill is extremely high quality, stone ground from locally grown Red Fife wheat, an Ontario heritage wheat. The sale of flour helps us fund the operation of the Old Stone Mill, which is owned by the non-profit Delta Mill Society, a group of dedicated volunteers. 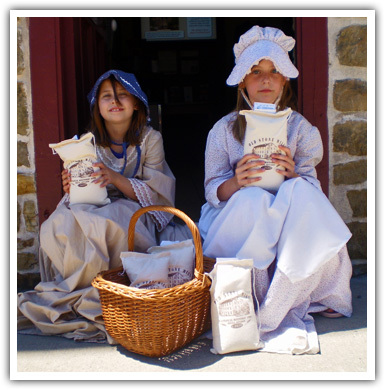 We are grinding grain into flour much as it was done when the mill was first opened over 200 years ago. We normally only have Whole Grain Flour available for sale - this is the grind directly from the stones. Sometimes, if we have enough volunteer support, we operate the bolter which sorts the flour by gravity and screening, allowing us to produce Fine and Bolted flour plus bran. suggested best uses for each grade of flour. Our flour consists of one ingredient, flour (that's it!). If you look at a bag of commercial flour you'll see other ingredients including amylase, xylanase, mononitrate, l-cysteine hydrochloride and azodicarbonamide. We don't include any of those in Old Stone Mill Flour. Our natural flour does require a bit of care - store it in a cool, dry place and for long term storage (longer than 2-3 months), put the flour, in a sealed container, in the freezer. Have a look at our Photo & Video Gallery to see photos and videos of grain being ground into flour.